THOMPSON, Bennie, a Representative from Mississippi; born in Bolton, Hinds County, Miss., January 28, 1948; B.A., Tougaloo College, Tougaloo, Miss., 1968; M.S., Jackson State University, Jackson, Miss., 1972; teacher; member of the Bolton, Miss., board of aldermen, 1969-1973; Mayor of Bolton, Miss., 1973-1979; member of the Hinds County, Miss., board of supervisors, 1980-1993; elected as a Democrat to the One Hundred Third Congress, by special election, to fill the vacancy caused by the resignation of United States Representative Alphonso Michael (Mike) Espy, and reelected to the thirteen succeeding Congresses (April 13, 1993-present); chair, Committee on Homeland Security (One Hundred Tenth, One Hundred Eleventh, and One Hundred Sixteenth Congresses). Oral History: 1990, 21 leaves. An oral history with Mayor Bennie G. Thompson / interviewer: Chester Morgan. The interview was recorded in Bolton, Mississippi, on February 13, 1974. 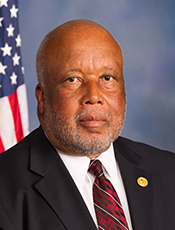 "Bennie Thompson" in Black Americans in Congress, 1870-2007. Prepared under the direction of the Committee on House Administration by the Office of History & Preservation, U. S. House of Representatives. Washington: Government Printing Office, 2008.